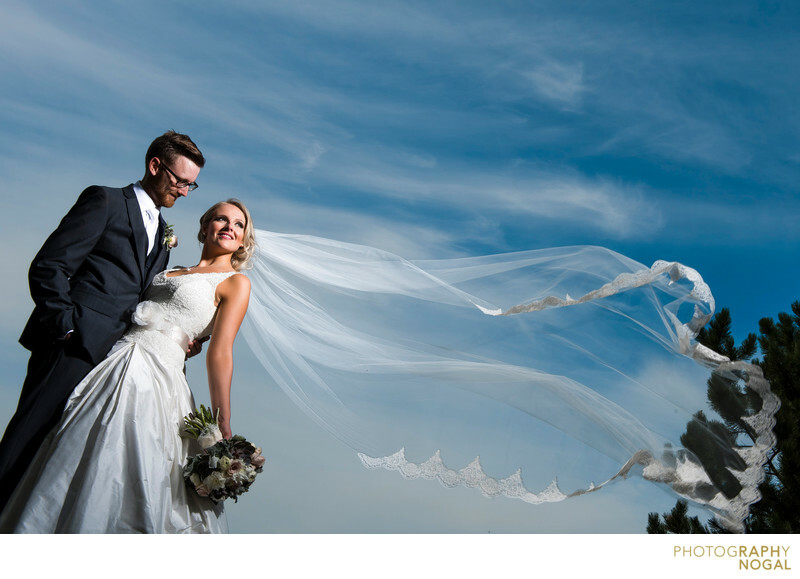 Using the outdoor scenery of The Manor by Peter and Paul’s in Kettleby, Ontario, the bride and groom were photographed against a blue sky. The bride’s veil was used as a creative element, to add fluid movement and eye-catching interest. The streaky clouds move in the same direction as the veil, making it seem like its blending into the sky. This photo was taken with a Nikon D750 DSLR at ISO 50, f13 aperture, 1/200th shutter speed with a Nikon Nikkor 24-70mm f2.8 zoom lens, at 42mm focal length. The lighting used was a Profoto B1 OCF flash fitted with the OCF Beauty Dish Silver. Location: 16750 Weston Rd, Kettleby, ON L0G 1J0.